Grand Rapids will always have a special place in my heart. I lived near the city when I was born and as a child, but I don't really have any memories associated with it from that time. Only when I moved back for college did I really start to get to know the city and start acquiring precious memories of fun times with my college friends around town. What I love about Grand Rapids is the balance--it's not a small town, but it's not an overcrowded metropolis, either. Even for this directionally-challenged girl, it's pretty easy to navigate on foot and to remember where different destinations within the city are located. 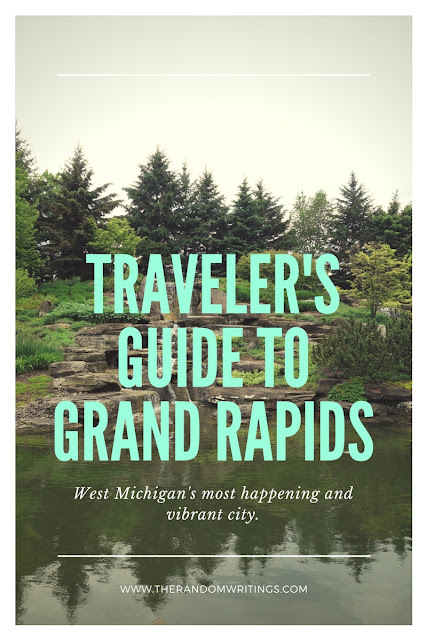 Disclaimer: I partnered with Experience Grand Rapids in order to produce this post. They provided two complimentary tickets to several of the locations mentioned. All opinions are, as always, my own. Let's just start with the greatest, shall we? I've loved Frederick Meijer Gardens since I was a kid and went there especially to see the butterflies during their short-term butterfly exhibit every spring. They are a great concert venue, and when I was in college, Angel and I had a membership here so that we could get first dibs on concert tickets--because they sell out fast! We saw Darius Rucker in concert at the gardens. On this most recent visit, we loved touring the outdoor gardens as usual, but we especially appreciated their current temporary exhibit by Ai Wei Wei, a Chinese artist with a passion for social justice who uses much of his art to bring to light human rights issues in his home country. Because of our background of living in China, this exhibit particularly struck an emotional note for both of us, and we spent a long time watching videos about Ai Wei Wei's story and reading placards about the symbolism in his art. Ever since I first told Sarah we'd be going to the Children's Museum, weeks before we even left on our trip, she was so excited that she would remind me nearly daily of our future plans. She was thrilled with the very idea of a museum designed purely for kids--a museum just for HER. She felt pretty important on the day Angel dropped the two of us off to experience the children's museum and she got to enter through her own kid-sized door. Sarah particularly enjoyed the mini-real-world set-up on the first floor of the museum, with a grocery store and a bank and a post office and mechanic shop and more, all kid-sized. Upstairs, we got to play with bubbles, and in the hospital area, I was rather traumatized by a doctor who kept insisting I wasn't getting enough oxygen and needed serious treatment. We were there during the afternoon painting session, so she got to make a painting to bring home. I think my favorite part of the museum were the strangely labeled bottles of food. I'm pretty sure I want the job of labeling food for the children's museum. If I can't have it, I want to be friends with the person who has that job, because their sense of humor is AWESOME. I've been here a number of times, and have even gone to swing dance events held here during the winter time. On this most recent trip, we went with others in our family, and the hours sped by before we'd even seen all of the exhibits. Thankfully, we ended up going on the day that they were open late (go on Tuesdays if you'll need more time!) Some of the exhibits were new and updated since my last visit, including an exhibit all about the role of immigrants in Grand Rapids history, which I found especially fascinating. Also, because of my predisposition towards museums with a sense of humor, I loved the tongue-in-cheek "Metamorphosis of a BEATLE" and "Examples of Beetle Body Parts" exhibits. This is another highlight of Grand Rapids that I do have memories of visiting as a child. This small zoo resides in the midst of the city, making it more accessible to children who actually live in the city. I appreciate their commitment to keeping the zoo within the confines of the city, on the land that John Ball originally left to Grand Rapids more than a century ago. This is a small zoo, but that is reflected in the inexpensive ticket prices. When we went, it was May and very chilly, so not all of the animals were out in their exhibits yet. That it part of zoo life in Michigan--it's not warm enough year round for some of the animals! Our favorite animals we spotted were the grizzlies--they were very active, probably the most active I've ever seen bears! They had a lot of fun exhibits, and for us, with no children in our group, it was about a 2-hour visit to explore the entire zoo. With kids, I think you'd definitely want to stay longer so that they could enjoy the petting zoo and some of the jungle gym, playtime equipment they have there. This is the most educational of my picks for fun things to do in the city. 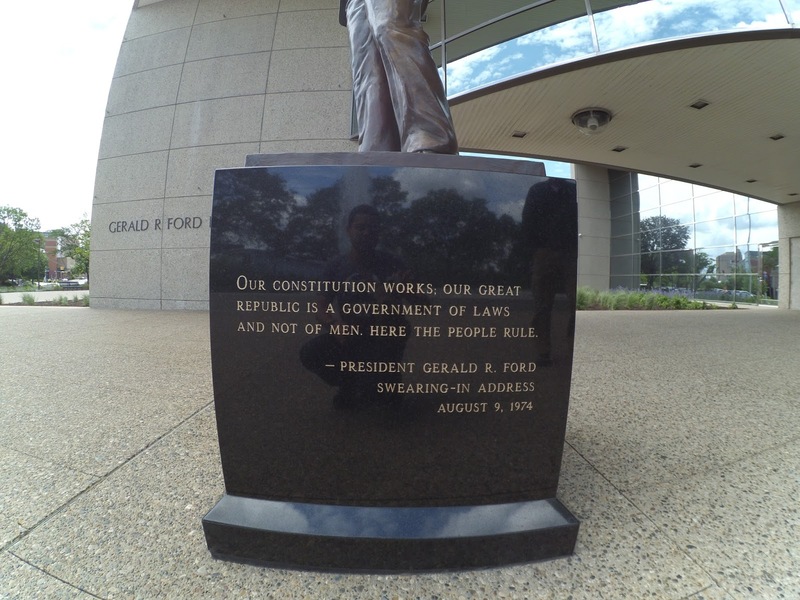 In Grand Rapids, we're proud of out "local" president and this Museum is dedicated to him and his impact on American history. Great one to visit if you're a homeschooling family and like to combine vacation with education! *cough* I don't know anybody like that *cough* Just kidding--the exhibits really are fascinating and if you have any interest in American history you'll be quite willing to visit! Grand Rapids is such a fun city to wander around the downtown area. At various times, there are community events going on: one of my favorites is GROSS, a swing dancing group that meets somewhere downtown every Tuesday all year long. Every September, Grand Rapids hosts ArtPrize, a city-wide art exhibition and competition. In the spring, there is Festival of the Arts. We also attended the Hispanic Festival every year for some good food and to hear some music that made Angel feel right at home! There are interesting cafes and restaurants on nearly every corner. The Van Andel Arena hosts concerts and sporting events throughout the year. Visit the Experience GR website to find out what events will be going on during your stay! There are a number of college campuses in and around town that are quite lovely and worth a stroll--Calvin College's campus and nature center are my favorite, but I may be a bit biased! Have you ever visited Grand Rapids? What's your favorite thing to do in the city? My dad has to travel there for work often and raves about it! I am going to have to make a trip there I think! Isn't it crazy how many amazing things there are to do in our backyard? There are so many lesser-known cities/towns that have so many interesting things to do that you don't even HAVE to travel far! It looks amazing there! I've never been to Grand Rapids, but these places look awesome! So cool you got to experience all these things (again)!! Michigan is definitely on my travel bucket list! I want to go there so bad! I have never been to grand rapids!! Looks lovely!!! I've been to the Festival of the Arts a few times...and also to a cool dueling piano bar downtown called Mojo's! The gardens/sculpture park looks like a lot of fun!! One of my favourite ever bits of graffiti was on a bridge over the M25 motorway around London. It simply read 'peas' for a number of years, until some bright spark added 'give' and 'a chance'. Gold. Grand Rapids sounds like it's got lots of fun things to do! I have to admit to not actually knowing where it is (sorry) but am now suitably educated. Take me to a zoo any day of the week and I'm happy. I know that I'm a grown up and all, but I love children's museums!! Memphis has a fun one that I've been to with kids a couple of times, but no joke - Christopher and I have gone to a couple of children's museums in different cities even WITHOUT kids in tow, haha! I haven't been here before. Looks like a fun place! How fab to go back an experience somewhere from your youth with your now family. The children's museum in particular sounds like greta fun! Thanks for sharing this with us on #MondayEscapes!